Por lo demás, el sistema operativo Fire OS apenas ha incorporado cambios respecto a su versión anterior salvo, por ejemplo, pequeñas mejoras en el apartado de gestión de energía. Una vez más nos encontramos ante un sistema operativo bastante rígido que no permite el uso de widgets en el escritorio, cambiar el fondo de pantalla, interactuar mediante voz, o muchas otras cosas que Android permite por defecto. Esta diferencia es ahora incluso mayor con la llegada de Android 5 Lollipop. 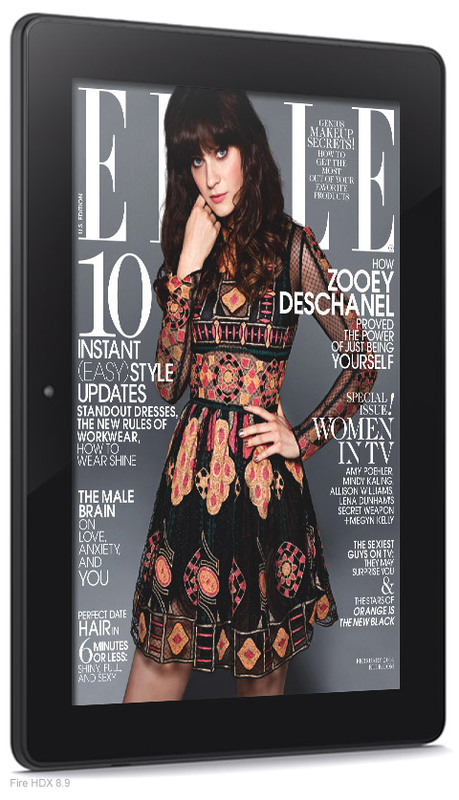 As a media and all-round entertainment machine, the Amazon Kindle Fire HDX 8.9 is a solid rival for the iPad Air 2. 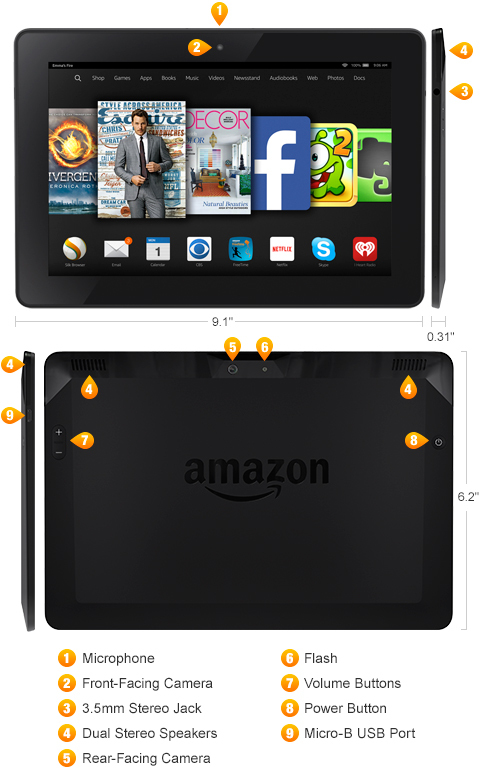 However, there is a caveat, and that’s the tablet’s deep roots in Amazon’s ecosystem. Prime members will delight in the Instant Video integration while anyone with a sizeable Kindle library can access all of their books with a tap, but anyone less convinced should maybe look elsewhere. Good things about the new HDX 8.9: great screen, excellent battery life, quick-as-blazes processor and superb graphics. The speakers are very good too. Bad things: no Google apps, no Google Play Store, no storage expansion and Fire OS, even in its latest iteration, looks a wee bit dated compared with stock Android even if it is piss-easy to use. Impressive the hardware aside, as with the Fire Phone the more in bed you are with Amazon as a content provider the more you’ll get on with, and out of, the new Fire HDX 8.9. In the end, if you’re not dissuaded by some of the limitations of Amazon’s Fire OS and, better still, if you’re an Amazon Prime subscriber or buy a lot of content from Amazon such as Kindle eBooks, the new Fire HDX 8.9 is by far the best tablet Amazon has produced to date. Its battery life is incredible, its display is fantastic and it looks and feels great in your hands. If you're looking for a family tablet that everyone can share, and you're happy to dive into the Amazon ecosystem and sign up for Amazon Prime, maybe even pick up a Fire TV as well, then the Fire HDX 8.9 is probably the best tablet for you. It handles movies and TV shows beautifully. It's a lovely device for reading on. The audio quality is also impressive. Tack-sharp, vibrant screen. Superb battery life. Top-notch stereo speakers. An immersive headphone experience with Dolby Atmos. Great integration with Amazon services. Unlimited cloud storage for Amazon content makes the 16GB version doable. 24/7 video help. Firefly is neat-o. App ecosystem lags behind iOS and Android, and Google apps could fill in big gaps. The best deal is an 16GB version with lock-screen ads, but the an ad-free 32GB HDX jumps up to $444. Doesn’t look any different than the last one. Firefly doesn’t always work. The 2014 Kindle Fire HDX 8.9, much like last year’s model, is a great tablet for entertainment. That's really where it excels. It ticks those all-important boxes you want in a larger tablet as well: it’s light and comfortable to use, has fantastic speakers and a gorgeous screen. The new Kindle Fire HDX 8.9 sticks with much of the same great hardware but with a few improvements that make it a fantastic tablet for video and reading. Its only downfall is an operating system that still needs some fine-tuning. Amazon's updated 2014 Fire HDX 8.9-inch tablet seems to be a bit of a reactionary one. The device hasn't really changed much other than a faster processor and improved networking. Meanwhile, the competition has made some significant changes. This is still a good tablet, just not as great as it was when first released. In using the HDX 8.9, I find myself able to do core things I want in a tablet, like email or gaming, and watching movies is a breeze. The screen on the HDX 8.9 is phenomenal, which only makes you want to watch movies and TV on it. The touchscreen is responsive, too. Interacting with the device is a pleasure. That's the plus and the minus of the Fire tablet series in a nutshell. 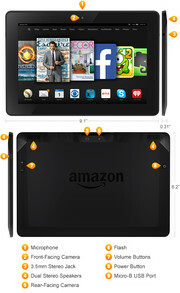 Amazon makes it clear: This is not an Android tablet. It's an Amazon?tablet. And while that may give a lot of geeks the heebie-jeebies, it's a simple, clear path for people who don't want to worry about the technical details of their tablets. The Amazon media stores, FreeTime, and Mayday all come together in one theme, which is creating a tablet experience with even more hand-holding (and thus less flexibility) than Apple provides. Impressive battery life and comprehensive parental controls are just a couple of great reasons to buy the $379 Fire HDX 8.9. The high-resolution display is stunning, and you get fast performance and a suite of exclusive features for getting the most out of Amazon's vast library of content. 0.375 kg: Esto es bastante pesado para un smartphone. Normalmente los tablets pequeños pesan así.